Excel has many built-in formats that you can use: Currency, Accounting, Date, Time, Percentage, etc. 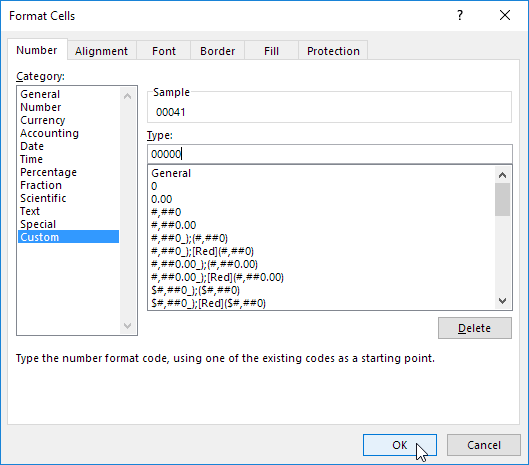 If you cannot find the right format, you can create a custom number format. For example, you might have codes that consist of 5 numbers. Instead of typing 00041, simply type 41 and let Excel add the leading zeros. 1. Enter the value 41 into cell A1. 2. 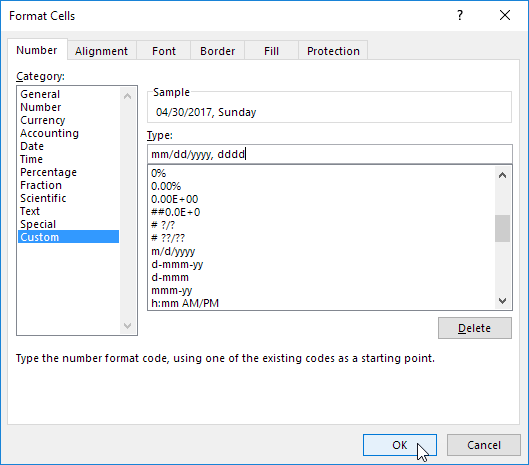 Select cell A1, right click, and then click Format Cells. Note: Excel gives you a life preview of how the number will be formatted (under Sample). Note: cell A1 still contains the number 41. We only changed the appearance of this number, not the number itself. You can also control the number of decimal places. Use 0 to display the nearest integer value. Use 0.0 for one decimal place. Use 0.00 for two decimal places, etc. 1. Enter the value 839.1274 into cell A1. You can also add text to your numbers. For example, add "ft". 2. Use the following number format code: 0.0 "ft"
Note: remember, we only changed the appearance of this number, not the number itself. You can still use this number in your calculations. You can also control large numbers. Use one comma (,) to display thousands and use two commas (,,) to display millions. 1. Enter the following values in cells A1, B1, C1 and D1: 1000000, 2500000, 81000000 and 700000. 2. Use the following number format code: 0.0,, "M"
Note: we used 0.0 for one decimal place and "M" to add the letter M.
Use the asterisk (*) followed with a character to fill a cell with that character. 1. Type Hi into cell A1. Note: the @ symbol is used to get the text input. You can control positive numbers, negative numbers, zero values and text all at the same time! Each part is separated with a semicolon (;) in your number format code. 1. Enter the following values in cells A1, B1, C1 and A2: 5000000, 0, Hi and -5.89. Note: #,## is used to add comma's to large numbers. To add a space, use the underscore "_" followed by a character. The length of the space will be the length of this character. In our example, we added a parentheses ")". As a result, the positive number lines up correctly with the negative number enclosed in parentheses. Use two parts separated with a semicolon (;) to control positive and negative numbers only. Use three parts separated with a semicolon (;) to control positive numbers, negative numbers and zero values only. You can also control dates and times. Use one of the existing Date or Time formats as a starting point. 1. Enter the value 42855 into cell A1. 3. 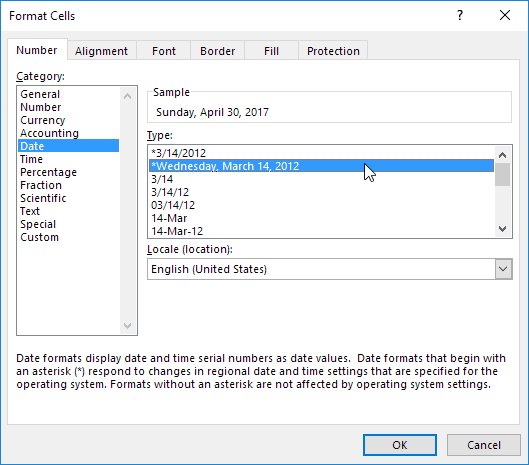 Select Date and select the Long Date. General note: a custom number format is stored in the workbook where you create it. If you copy a value with a custom number format to another workbook, it will also be available in that workbook.